When we travel, we’re often in marginal cell reception areas. We’re not looking for 100% coverage every time we park up, but especially when we’re driving it’s nice to know we have a way to communicate in an emergency. That’s why we bought a cell phone booster kit. Kits come in multiple configurations and price points, from a piece of foil you stick on your phone (questionable science, questionable value) all the way through to things that pretty much act like a whole new cell tower. 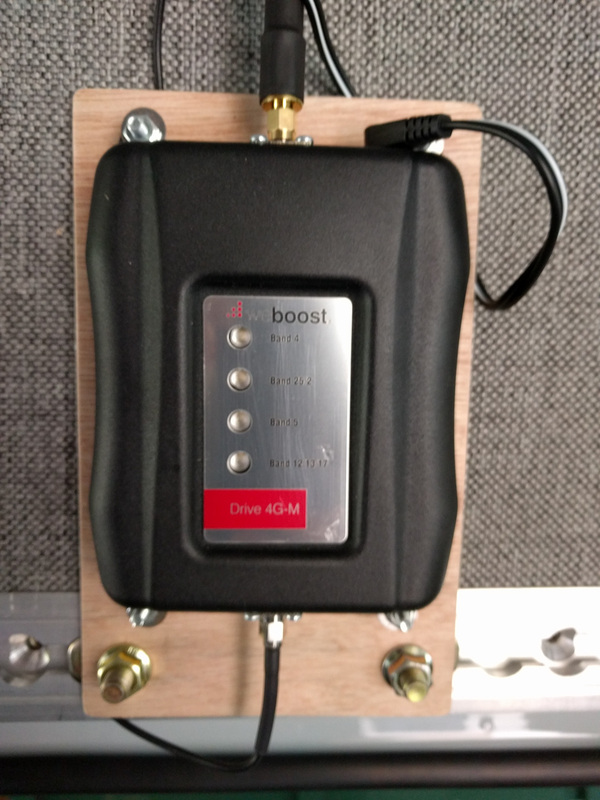 We chose to buy the WeBoost 4G-M cell phone booster kit because it has some good reviews. They also make a 4G-X with more sending power, but for us the price/benefit trade-off put us with the 4G-M model. The kit comes with an external antenna for picking up and sending cell signals to the tower, an internal antenna to rebroadcast those signals to your phone inside the vehicle, and the amplifier. The amplifier plugs in to a 12v cigarette lighter socket. The internal antenna needs to be close to where the cell phone(s) will be used. We mounted ours on the headliner just above the rear view mirror in the cab. It comes with velcro mounting tape, but the hook part of the tape on the antenna stuck well enough to the headliner that we didn’t need to add the loop part! The external antenna is a magnet-mount version. It’s designed for passenger cars, not for big vans. The 15′ cable really isn’t long enough to provide sufficient distance between the internal and external antennae. If they are too close, the two antennae create a feedback condition called oscillation. To prevent it, the amplifier turns down or turns off its power. We replaced this stock antenna with a Laird 3G/4G MultiBand at the back of the van, opposite our wifi antenna, and used some low-loss LMR-400 cable to get from there to the amplifier. The LMR-400 cable is thick and doesn’t bend into a very tight radius, so you have to plan where you will route it. We used a 90 degree elbow connector on the antenna so that the cable would fit in our ceiling space. 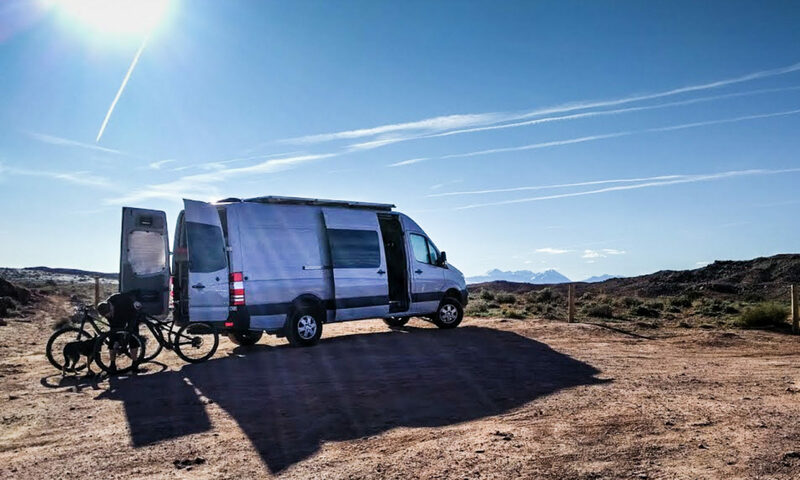 I am thinking about the same setup in my sprinter. Have you noticed a significant improvement in the signal? George, we’ve been in situations where the phone showed no bars at all without the booster, then at least one if not two with the booster. We’ve also been in places where we struggled to get Edge data and the booster gives us LTE. It’s not magic. It won’t create signal when there is none, but it’s good for making a very limited signal into a usable signal. Thanks for the quick response! I think this will really help me work from the road. Your site has been such a great help! Mounting: How did you mount the Laird antenna to your roof? Did you use a bracket of some kind? Did you drill a hole in the roof for the cable or run it through the rear doors? Internal antenna: What is the reach of this antenna? I’m planning to use it with my Verizon Hotspot and cell phones. Does it have to be inches away or from anywhere within the van? We used a direct-mount Laird antenna. That required drilling a hole through the roof. We used the same technique as for our wi-fi antenna. With the direct-mount antenna, you attach the cable to the base of the antenna after it’s through the vehicle skin. I think it’s worth experimenting with the external antenna that comes in the kit before upgrading to the Laird. If you can find a way to run it into the vehicle (roof vent?) then you can see if that’s sufficient for your needs. Remember it needs to be placed on a metal surface in order to work correctly. The internal antenna doesn’t have a superb reach. The directions say that devices should be more than 18″ away from the antenna, but that reception drops off with distance. So, with the internal antenna in the position we mounted it above the rear view mirror our cell phones work fine from the driver and co-driver seat but not so well from the rear of the vehicle. If you put your Verizon hotspot on the dash, it should be ideally placed for reception. WeBoost do sell other internal antennae, but the issue you’ll face if you use one with greater coverage is oscillation. If the external antenna picks up the rebroadcast signal from the internal antenna, it creates a feedback loop. To stop that from happening, they use an internal antenna with a smaller signal area. Thanks for the tip. I bought the weBoost Drive 4G-X on your recommendations. I am testing it in my minivan before installing it into the Sprinter. – Lots of static on the FM radio, sometimes to the point that I no longer get any FM reception. Not a big deal, I guess I can’t have both on at the same time. – On the iPhone 7, places where I get 1-2 bars, it turns to 3 bars sometimes. Oddly enough, places where I get 3-4 bars, it seems to make it go down to 2 bars. Not sure if that is a real affect. Not sure I see a consistent pattern. – I will test it out in Yosemite next weekend. In the past I get 0 – 1 bar, hardly every LTE, we’ll see if this unit helps. Fingers crossed. Thanks for sharing the results of these tests. I’ll be interested to see what you find when you install it in the Sprinter. The FM reception in the van is terrible at the best of times. It doesn’t need to get any worse! In the WeBoost manual it mentions that the booster can actually reduce your reception in areas that already have good reception. It’s annoying when you’re in patchy signal areas like hills and valleys. Yosemite will be a good test. Just remember it’s not a magic device – it won’t make signal from nothing. We’ve been pleasantly surprised though with how well it can find a signal when our phones report no bars. When you do the van install, try and put the power switch for the booster in a place where you can reach it from the driver’s seat. That way, you can turn it on and off as needed on the road. Reporting back from my test in Yosemite National Park. With a Verizon iPhone 7, I was able to get 2-5 bars and even LTE. The booster added 1-2 bars. I pretty much have signal throughout my trip, so my conclusion is that it works pretty well. I use to have AT&T and would not get much signal. Excellent. I’m glad it worked for you. We are figuring out the best place to install/mount the internal antenna. One place our builder has suggested was in the hinged lid on the dash, perhaps together with the Jetpack. This location should also be closed to where we will use our cell phone in the driver/passenger area. Have you consider this location? Do you see any issues with this? I presume the hinged lid on the dash is plastic and would not interfere with the antenna. George, I don’t have the instructions to hand but I seem to remember it said something about an optimal distance. In other words, if the phone is too close to the antenna it won’t work so well. It might be that the antenna would be too close to the Jetpack if you install it in the hinged lid of the dash compartment. That’s why we chose the underside of the console in the headliner, just above the mirror. That location isn’t perfect, but it works OK for us. I’d be interested to know how well it works in the dash compartment if you do choose to install it there. How many Ah are you guys seeing these things using? Wilson rates them at 3.3A so that’s quite a large draw. Yes, the booster does have a high draw, but we’re seldom using it for a long period of time. I guess if we needed to leave it on while we waited for an incoming call then it might be an issue but we’ve not had problems.